On Veteran’s Day, I had the day off and enjoyed lunch with a friend at Freeman’s (mmm). We both got their lentil salad, and it was so delicious that we each decided that we must make lentil salad ourselves as soon as possible. Jack Bishop’s A Year in A Vegetarian Kitchen is filled with healthy recipes that highlight seasonal food. This recipe was great because I was able to make it a few hours ahead of time, and then just put it all together at the end. It was delicious for lunch the next day as well. Are you scared of cooking lentils? You are not alone. I am not a very experienced lentil cooker, and they usually end up mushy and bland. This recipe turned me into a believer. I will put the exact recipe below, but I actually cooked my lentils at least 5 minutes less than he suggests (mostly because I was in a hurry.) The lentils were just the right consistency. Move an oven rack to the middle position and heat the oven to 425 degrees. Toss the turnips, onions, 1 tablespoon of the oil, and salt and pepper to taste on a large rimmed baking sheet. Roast, stirring the vegetables once or twice, until lightly browned, about 40 minutes. Cool slightly and finely chop the onions. Meanwhile, bring the lentils, garlic, bay leaves, and 6 cups of water to a boil in a medium saucepan. Reduce the heat and simmer for 20 minutes. Stir in one teaspoon salt and continue cooking until the lentils are tender but not mushy, about 5 minutes. Drain and discard the garlic and bay leaves. While the lentils are cooking, whisk the lemon juice, mustard, and salt and pepper to taste in a large bowl. Whisk in the remaining olive oil until the dressing in smooth. Whisk in the tarragon and adjust the seasonings, adding more salt and pepper as needed. Add the warm lentils, chopped onion, and roasted turnips to the bowl with the dressing. Toss to coat and adjust the seasonings, adding salt and pepper to taste. Cool to room temperature, stirring the lentil salad from time to time to promote even absorption of the dressing. Divide the greens among four large plates. 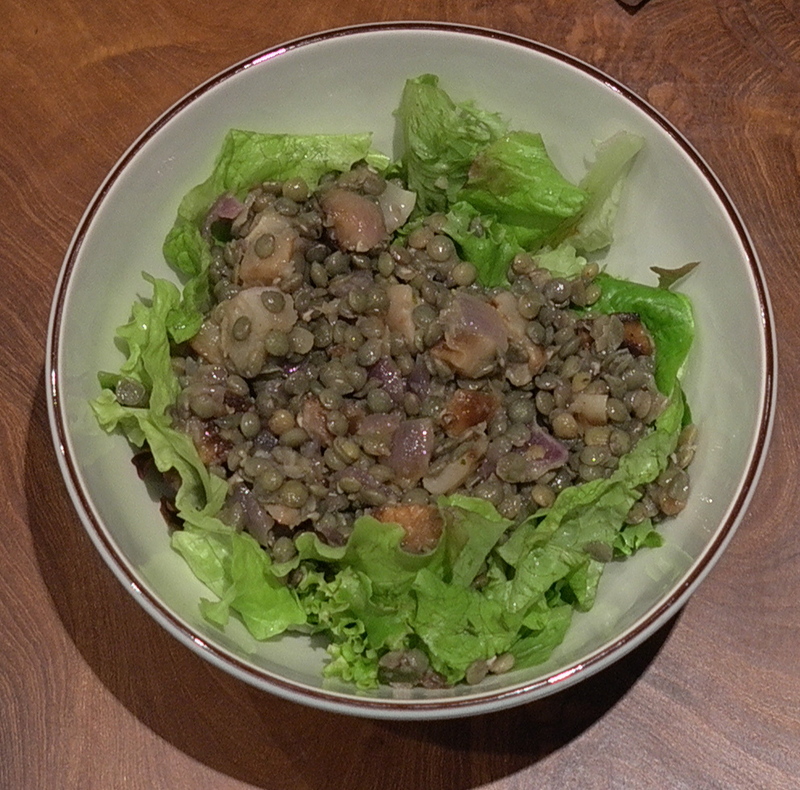 Spoon the lentil salad over the greens and serve.